ADHD reWired is proud to have Dr. David Pomeroy join us in the virtual studio. Dr. David Pomeroy founded Brain Health NW in 2005. He is a Family Medicine physician with over 25 years of office practice experience, with the intent of providing thorough evaluations and holistic medical treatment for Attention Deficit Disorders and mood disorders in children, teens, and adults. Mission Statement: “The mission of Brain Health NW is to provide compassionate, informed and up-to-date high-quality care to individuals and families affected by behavioral, psychological or psychosomatic disorders. 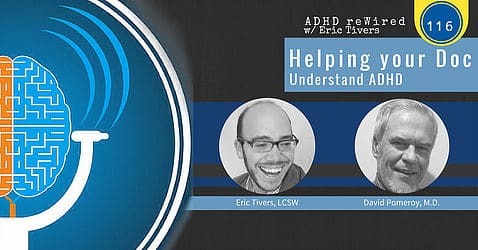 This was a very unique show in that Eric and Dr. Pomeroy discuss issues surrounding ADHD at the Clinical level. To be clearer, Eric tailors his questions to doctors who may not me up on the Latest ADHD research need to know. There is a problem in the medical community surrounding not just ADHD but mental illness. 15 minute monthly appointments in many cases. This sort of drive by delivery of patient care is just not satisfactory. Another problem is fear. Many doctors are fearful of lawsuits resulting from medication. They when through a host of different medications and discussed side effects, effectiveness and criteria for subscribing them. Dr. Pomeroy has had extraordinary success by monitoring and testing and re-testing. This show is a must hear for Doctors. If you have a doctor with whom you are friendly, We here at ADHD reWired would encourage you to share this show with them.